This is the third of five paintings that hung at the 'Along Your Street' exhibition at Byard Art between 31 May and 1 July 2018. I love Cambridge. I love it's quirkiness and the amount of people that have PhD's in all sorts of weird and wonderful subjects even though they look just like everyone else. I love the buildings, although I don't know exactly what happens inside them - and I love the free museums. 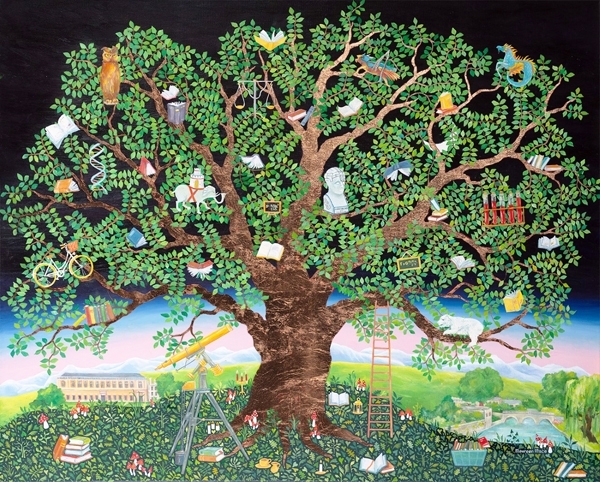 Some time ago I painted a 'Tree of Cambridge' which had an assortment of images from town and gown. My 'Tree of Discovery' delves a bit deeper. It is another puzzle so I won't give a list of what the images represent but if you have tried to guess them, please email and I will send you the list of references. A print is available of this painting.